Please could anyone tell me what records there are, that could tell me anything about the following man. William Richard Broome of The Guadalasca Rancho . He was born in Macclesfield Cheshire in 1854. I do not know when he died. He was a trained chemist and druggist. Taken from Ventura County history published 1891. The Guadalasca Rancho 23,000 acres were purchased some years since by William Richard Broome, an English gentleman of leisure, living in Sants Barbara. Please could you point me in the right direction. Under Google books, there is a book called California editor By Thomas More Storke, Walker A. Tompkins. 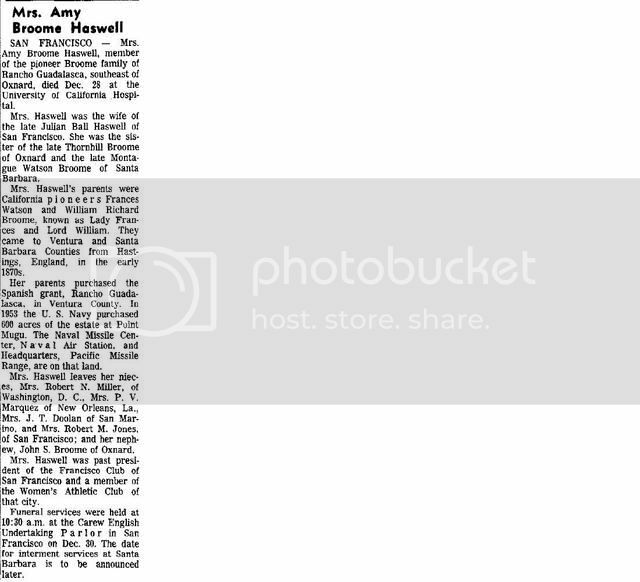 Only a snippet view is available, but on a page that has Guadalasca Rancho on it, it says "Among the first to build a palatial home in the city proper, rather than in Montecito, were Lord and Lady William Richard Broome of England. They arrived in 1876, the year of my birth. Lord Broome was born in Yorkshire and had been educated as a..." and that's all you can see. 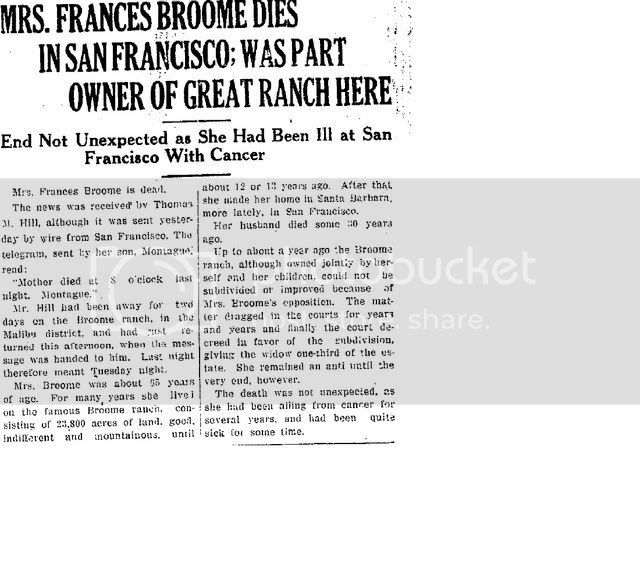 Google books also has The Pacific Reporter, which mentions a case dealing with William Richard Broome's estate. His widow Frances was appointed executrix of the will on 25 July 1891, so I guess he died sometime before then. mother estate. They both died when he was young and his Grandmother brought him up and his sister. Frances & daughter Amy seem to show up in the 1900 in Santa Barbara. 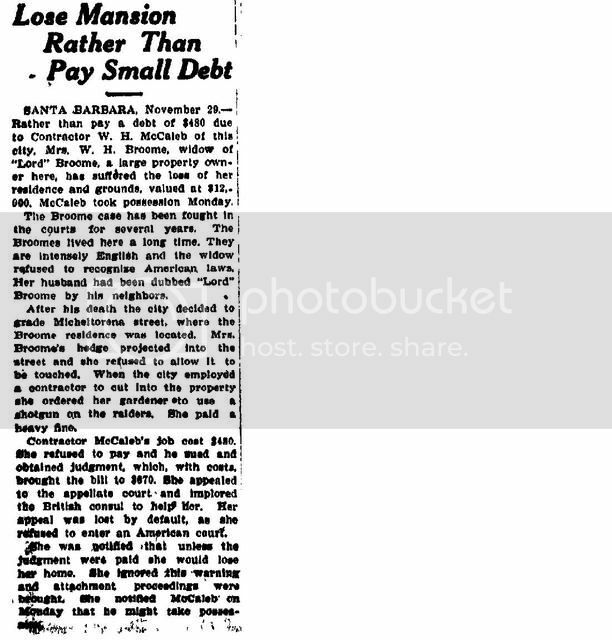 In the 1910 Census, they are still in Santa Barbara and are listed as boarders. money went to their heads. I really don't know what his sister must of made of it. and make the print bigger. In 1899, The Mountain Democrat paper says Frances' attorney was suing her for $2750 in attorney's fees related to her recent trial in which she was found guilty of resisting an officer. 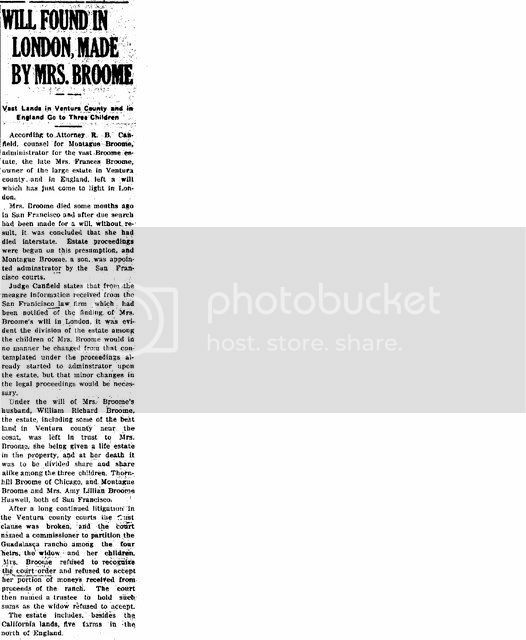 There's an article in the Washington Post from 1911 which refers to the "real Lady Broome (whom I style thus to distinguish her from the bogus "Lady" Broome, who landed in jail in Santa Barbara, in California, a couple of years ago)" Fun family. I also found a full page article from a California newspaper in 1972 about one of William's grandsons. They sound a mad as a box of frogs, I bet there was never a dull moment with them about. Thank you for all your hard work in finding them, It makes his sister life sound very restful.